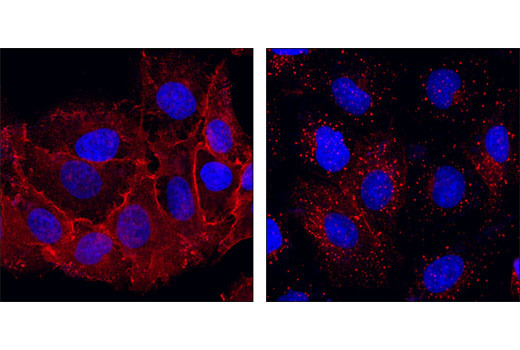 Confocal immunofluorescent analysis of A549 cells, serum-starved (left) or EGF-treated (#8916, right), using EGF Receptor (D28B1) XP® Rabbit mAb (Alexa Fluor® 555 Conjugate) (red). Blue pseudocolor = DRAQ5® #4084 (fluorescent DNA dye). EGF Receptor (D38B1) XP® Rabbit mAb (Alexa Fluor® 555 Conjugate) detects endogenous levels of total EGF receptor protein. The antibody does not cross-react with other proteins of the ErbB family. Monoclonal antibody is produced by immunizing animals with a fusion protein containing the cytoplasmic domain of human EGF receptor. The antibody was conjugated to Alexa Fluor® 555 under optimal conditions with an F/P ratio of 2-6. This Cell Signaling Technology® antibody is conjugated to Alexa Fluor® 555 fluorescent dye and tested in-house for immunofluorescent analysis in human cells. The antibody is expected to exhibit the same species cross-reactivity as the unconjugated EGF Receptor (D38B1) XP® Rabbit mAb #4267.